Discussion in 'Modding Guides and Tools' started by midspace, Nov 24, 2013. Version 01.186.500 Release 2 is up. Download the latest from here. After years, the asteroids can now be viewed and edited in SEToolbox again. We've tapped into the Space Engineers' API to allow loading and editing of current version of the asteroid files. Improved Save game Open screen. We've made changes to how the load screen works, allowing it to scan through all your saved games faster before bringing up the dialog, so you don't have to sit there waiting. Additionally, it now checks the save files when you open it, and displays any issues typically encountered when loading old or corrupted save games. We are looking for help in translating SEToolbox to Chinese and German. Version 01.186.500 Release 4 is up. Download the latest from here. Fix when starting SEToolbox, it was failing to detect if an updated version was available. SEToolbox can now read the textures and display the thumbnails icons for cubes and components. 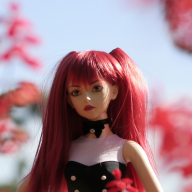 This feature was lost when KeenSWH started using DX11 textures for thumbnails. This caused an issue when reading the planet dimensions an calculating the centre. If you like see these updates to SEToolbox, please make sure thumb up or mark as informative. I don't have any other way of measuring stats to know how many people are downloading the updates. It keeps giving me the error "Invalid location specified." SEToolbox is not compatible with the MPTest branch which is currently been used by KeenSWH for multiplayer testing. Can you confirm which SE branch you are using? Version 01.187.87 Release 1 is up. Download the latest from here. The latest Update 1.187 of Space Engineers contains breaking changes. You must download this version of SEToolbox to be able to continue using SEToolbox with Space Engineers 1.187. Die erste deutsche Textausgabe. Dies ist keine vollständige Übersetzung aller Wörter. Es sollte zeigen, wie weit die Übersetzungen gegangen sind. Die ZIP-Datei enthält alle Sprachen. Laden Sie für das deutsche Installationsprogramm die Datei (de) herunter. Fix for conversion between heavy and light not working for half blocks. What you have posted is not an error. 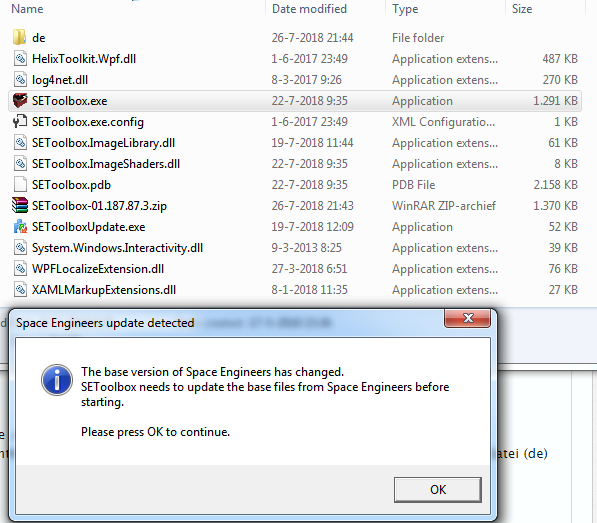 This is the normal process that SEToolbox uses to update it's files from Space Engineers when Keen release an update to Space Engineers. This is detailed as part of the wiki when you install SEToolbox. So I'm having an error with the generate resource report option. I need it because my dedicated server provider is requesting a copy of it so that they can help with insane lag on the server. How do I fix this error? Would be able to send me a copy of the world? This will help me in isolating the bug, which appears to be related to ore, I am guessing modded ore.
You can PM the details (dropbox link) if you dont’t want to share it publicly. You did receive my PM right? You did you see my reply, right? Version 01.187.87 Release 4 is up. Download the latest from here. Added ability to regenerate a planet, removing any existing changes, as well as resizing it at the same time. To use, select an existing planet, and press "Regenerate" on the sub menu. Fix to custom ores causing Resource Report to crash. I never got an email about a reply. Many thanks though. I have been getting this error every time I try to add an item to inventory. TimeSpan overflowed because the duration is too long. This only seems to happen when I use my normal account, if I elevate to Admin I don't have the problem. making it so I have to browse for the save. shows up besides vanilla blocks is an empty list of blocks that have Build % and X Y Z but nothing else. Can you please provide a copy of your world for me to look at. You can send me a PM with a link to the files in dropbox, or similar file service. Crash today (saturday, Aug. 25). Affects every world with voxels as far as I can tell. Toolbox worked fine yesterday, but today it crashes trying to load anything with voxels. I started two, brand-new worlds: one modded, one not, both using the solar system preset, Toolbox crashes trying to load both with a message about voxel storage. It also crashes trying to load an empty (asteroids only) world which I know hasn't been opened in SE since I used Toolbox on it yesterday, so it can't be a change in file format. Also tried it on a new empty world with asteroids turned off. World loaded fine. There was a hotfix today, apparently. Something about ships sinking through voxels, I hear. @midspace The error is in Sandbox.Game.Entities.MyVoxelBase.m_storage "Field not found"
Here's the event log in the spoiler. Thank you sir and I donated a decent amount a few years back (you're appreciated). System.MissingFieldException: Field not found: 'Sandbox.Game.Entities.MyVoxelBase.m_storage'. Version 01.187.204 Release 1 is up. Download the latest from here. The latest Update 1.187.204 of Space Engineers contains breaking changes. 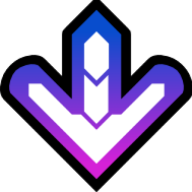 Added ability to Import from Ship Blueprint. This means you can now import from a Ship blueprint, make changes, and Export back to a ship blueprint. It's a full lifecycle. Fixed the check for new version. Again. GitHub keeps changing the html in the latest Release page, so I have changed it to check the returned url instead. Those pesky Microsoft Programmers, just making work for themselves to keep getting paid. On the never-ending-list... could you make an option to export the ship recipes to a .csv file (ore, ingots, components)? That info is great to have when posting ships in the workshop and gathering resources on servers. The data is already there so it shouldn't be too much work. Thanks man! It's a good idea, but probably best to leave the ore out of it. It is subject to how efficient your refining is in game. Whether you are using an Arc Furnace, or how many yield efficiency modules are on the Refinery. Do you have any suggested formats? You can link some favorite workshop items here. I don't have any particular format I'm devoted to. I typically roll my stuff into a spreadsheet. Perhaps a .csv file for us "sheet" heads and possibly an XML formatted table for pasting into the workshop descriptions? Not a priority... but another great tool for the tool box. There is already the "copy text detail to clipboard" button, but only works for a single grid, not multiple selected grids. It's in a tab delimited format. If anything, I need to expand that for multiple grids. Is that format sufficient if I expanded it to export? I realised today I need to add PCU information to all panels. Nice work with the Planets Regenation but i guess these no way for it to Ignore areas were player bases are underground yet ? Single grid is good enough for me. Tab delimited is perfectly fine. PCU information would be most helpful. 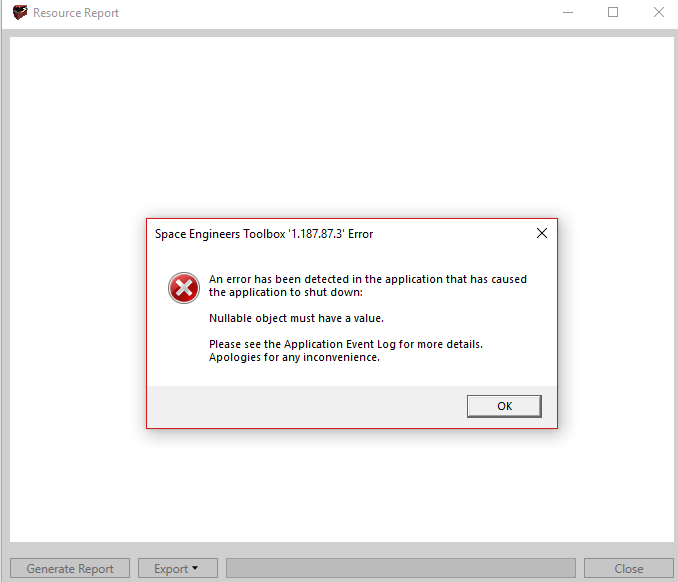 It appears that due to the new changes in Space Engineers 1.188 in how it handles mods, SEToolbox can no longer load them. "Changed downloading of mods to use Steam UGC API"
If you have previously downloaded mods under SE version 1.187, they would be stored under the Path "C:\Users\...\AppData\Roaming\SpaceEngineers\Mods\"
Whilst files remain there, SEToolbox can still load them. The new method that SE uses, has the downloaded files stored them in another location which requires Steam API access to determine the location. The description for Event ID 0 from source SEToolbox.exe cannot be found. Either the component that raises this event is not installed on your local computer or the installation is corrupted. You can install or repair the component on the local computer. What i understand is, it cannot access the internet, but why is it required? What is this calling home so important the program cannot even start without?